Carl Randall has won the BP Travel Award 2012 - for a proposal I found most intriguing. Carl won for his proposal to travel along the Nakasendo Highway between Tokyo to Kyoto in the footsteps of Japanese woodblock print artist Ando Hiroshige (1797-1858). On route he will record the people, their livelihoods and the landscape as finds them today in contrast to what was portrayed by Hiroshige. Carl’s final work will consist of a series of small-scale portraits and they will be displayed in the BP Portrait Award 2013 exhibition. The BP Travel Award aims to provide the winning artist with an opportunity to experience working in a different environment, in Britain or abroad. 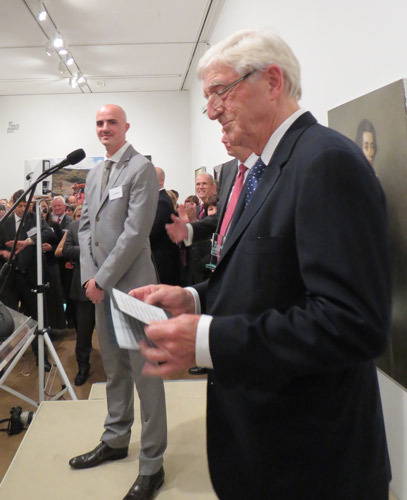 The intention is that the award should fund a project related to portraiture. Carl Randall's work will be shown as part of the BP Portrait Award 2013 exhibition and tour in 2012-13. I've always loved the idea of the series of paintings associated with travelling along a road. I asked him how long he intends to go for and how many portraits he hopes to complete. Carl told me he expects to go for about six months. En route he will be taking photos and making sketches and studies. Given that his models are to be found along his route, he will be doing quick studies only while travelling. He expects his studies of his subjects will last no longer than 2-3 hours. Carl told me that he can paint very fast! He will then bring the material found on his journey back to his studio. He's expecting the project will result in 4 to 5 large portraits and maybe 10 supporting smaller images. I'm guessing they're going to be somewhat like his 2004 painting of Mr and Mrs Kawakami and the Rice Fields of Hiroshima and/or his recent drawings of Hiroshima survivors. What I am confident about is that most of his work will be monochrome - if his past work is anything to go by. 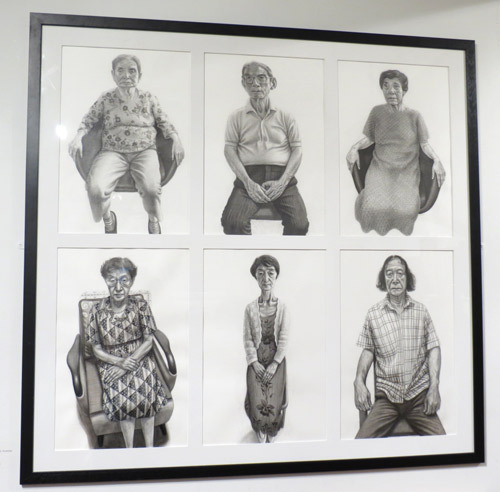 Carl was selected to be artist in residence in Hiroshima City (to meet and make portraits of survivors of the Atomic Bomb) and has recently exhibited 'Hibakusha Portraits', a series of six drawings of survivors of the atomic bomb made in Hiroshima Japan, at The Royal Society of Portrait Painters annual exhibition, the Mall Galleries, London. 3 - 18 May. It won't be the first time Carl has travelled to Japan. He has lived in Tokyo for the last eight years - since 2003. Nor is it the first time he's won a major award for painting (see a list of his awards). the £15,000 1st prize in the 1998 Singer & Friedlander/Sunday Times Watercolur Competition Exhibition which had over 1,200 entries. in 2002, he won the The Prince of Wales Drawing Studio Landscape Painting Expedition which involved a two week landscape trip, staying at the Forbes Chateau de Balleroy in Normandy, France. 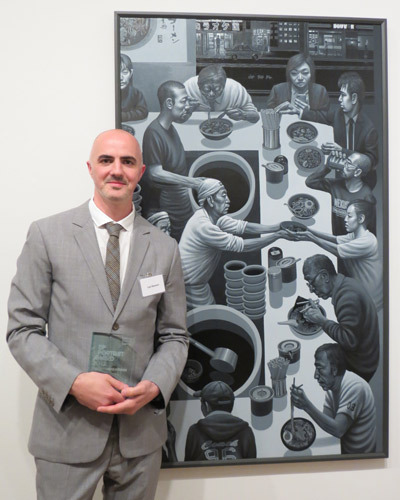 Since graduation in 1999, he's done a postgraduate Drawing Year at the Prince's Drawing School (2002-03) and was in the same year as Stuart Pearson Wright. In 2003 he became a Daiwa Anglo-Japanese Foundation Scholar. This provided a 20-month scholarship to continue his art career in Tokyo, Japan. At the end of this, he pursued his postgraduate education at the Tokyo University of Fine Arts, gaining a Masters Degree in Oil Painting and, for the last three years, working towards his Doctorate in Fine Art. Tokyo University of Fine Arts, Japan. During this time he was awarded the 2011 Nomura Painting Prize – and one of his recent works was bought for the permanent collection of Tokyo Geidai Art Museum. 'Notes from The Tokyo Underground', a collection of line drawings made on Tokyo trains, is to be exhibited at The Jerwood Drawing Prize, Jerwood Space, London, Sept 8 - Oct 28, 2012. Exhibition also touring the UK, including to the new Jerwood Gallery, Hastings. Paintings and drawings made in Japan will be exhibited at 'Tokyo Portraits' a solo exhibition at The Daiwa Anglo-Japanese Foundation, Japan House, Regents Park, London. January to March 2014.